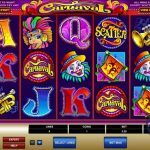 If you thought that you couldn’t make it to this year’s Rio de Janeiro’s carnival now you can with this video slot game from Microgaming, Carnaval. If you have been to a carnival before you know what to expect from this game. We have bold colors everywhere, trumpets, clowns and even the card symbols are jolly and not boring. You cannot avoid the party atmosphere, you just have to join it and have fun while doing it so. 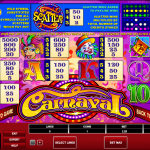 Carnaval is a very simple video slot game despite the noisy graphics. We do not have any special features here, as you might already notice. But that does not mean that the game is worth the try. We have a wild symbol that can spice things up a bit. Its function in this game is to substitute for every other symbol except for the scatter to complete a winning combination. Then we have the scatter which offers scatter payouts. And the good news when it comes to this symbol is that it does not have to be a part of a winning line to award you, you just need 3, 4 or 5 scatters on the reels. 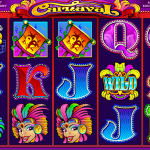 Carnaval is a very vibrant video slot game from Microgaming. This is exactly the game we were looking for. It offers superb gaming experience where you do not have to stress out whether you activated a special feature or not. You just have to concentrate on the game and enjoy the ride. The lack of features is not something that should make you skip this game. This has been done with an intention, to focus on the game play and maybe win the jackpot on the way. For a chance to win big consider playing Burning Desire a 5 reel slot by MicroGaming.